Quick video of the outflow from the 3 bunkers on #7. Always great to see things working properly. We are attempting to get as many tees as possible aerated today before the rain arrives. We are using our Verti-drain deep tined aerate on all the tees. The video below shows the process. A short video regarding the walk paths and their use that lead to our fairways. They are designed for walking traffic due to their short height of cut. The short turf comes under a great deal of stress. Carts should enter fairways from the side of the fairway and cart path, not at the beginning of fairways. This leads to excess traffic lines and wear to our course. The video is a little unsteady but it is short in length. A couple of weeks ago we had a beautiful crop of dandelions around the based of our trees. I decided that we needed to spot spray with a backpack to kill them. When the tank was mixed, some non-selective material was either still in the tank or left in the line. We should have placed some rinse in the tank and sprayed it out to insure we had the proper material going down over the top of our turf that we wanted to keep. Hate making mistakes. Will insure proper material handling in the future. Members and staff have expressed concerns about wear and tear on the walk path between the bunkers on #9. I've produced a video regarding this issue and would appreciate that you take a couple of minutes to check it out. Some simple changes of patterns would help spread the wear and tear around the green instead of in a concentrated area. We are needle tining/venting our greens today and are using our walk aerator to place some holes in our collars. I've produced a couple of videos below which show our process. A little unscripted but does give some important points on what we are attempting to do and why. The reason for our three day holiday. 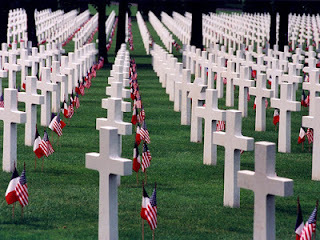 Take a moment to reflect on those who have gone before us and paid the ultimate sacrifice for the freedoms we so enjoy. 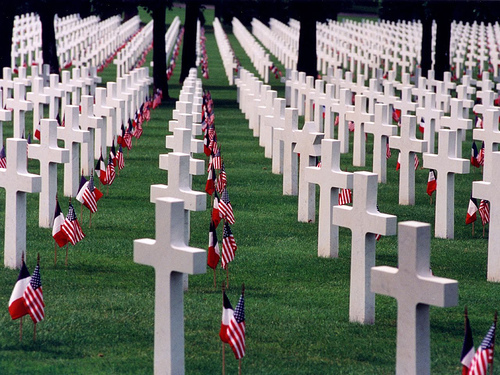 To our service women/men who currently serve we appreciate the sacrifices that you make. To the families of those currently serving, your sacrifice is great as well and we are thankful for you and give you our appreciation. Almost missed our birthday. Thanks to Heather for posting on Facebook. May 25, 1901 Glen Echo came into existence. 112 years of great golf, entertainment and camaraderie for our devoted membership. To the right of the old 17th front bunker, there was a patch of bermuda that we cut with the intermediate mower. With the new approach placed in zoysia, this area was going to be converted to rough height. No one likes a solid patch of bermuda at 3" so we removed it today. I had a pallet of fescue sod left over from the rut work last week and over the weekend we were trying to complete. The pallet got a little yellowed over the weekend. It should green up over the next few days as we lay it on the spot on #17. The bermuda remnants from 17 have been dumped on the targets on the short range and will be used to help cover the targets. With some heavy applications of water and fertilization, I would expect the targets to be completely filled in over the next 30 days or so if the weather gets to a more normal temperature for June. I know, brown side down not up. Sod will revive in the next few days. Replacing bermuda to the right side of #17 green. Chunks of bermuda that will make up the surface of our targets on the short range. Thanks to our members who participated in the plant sale. We raised almost $ 1,100. Thanks again for your support!! Part of the staff spent the day blowing the leaves and tree seeds off the tennis courts. 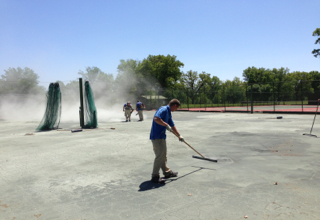 Then they had to blow the dead clay off the courts into piles so it could be picked up and hauled away to the dump. We hope to lay the 8000 lbs of new clay on the courts tomorrow and then set the lines. Jerry, our new tennis pro is assisting us with court preparation this year. The staff blowing the clay in piles and pushing the piles together to haul away. The short range will be closed after the 18 hole ladies begin their Match Play round on Tuesday morning for construction. We removed the smaller targets and added soil for a fourth target green today during the outing that was at the club. We still have to haul additional soil to the added target and the deepest target needs to be enlarged by a few feet as well. We will then begin finish grading the surfaces. Our last step will be to harvest some bermuda sod that will be used as sprigs that will grow and cover the target areas. I'm not sure if this will get completed on Tuesday but should get it sprigged by Wednesday. We will be seeding and strawing the old targets with ryegrass which will germinate quickly. Bermuda that was throughout the target areas should then grow up through the ryegrass giving us cover for the season. We intend to cut these targets at 1/2" which is the tee height. This should give you a good contrast is texture and color between the targets and the surrounding 3" rough. We will be placing the colored poles in the targets and will get our sign changed for the new yardages in the next few days. The fourth and newly added target to the range in the center. Still needs a couple more loads of dirt. A special thank you to all the mothers out their who helped to shape and share in our lives. I've been blessed to have a great Mom who raised four sons, two foster sons in high school, and a husband 32 years. Shared her care and concern for the fortunate and less fortunate through her efforts in health care as well as volunteering in and out of her community. After the death of my father and her husband, continuing to grow and move forward in her life always striving to do more. We were having a discussion just a few years ago about life's events and she made a statement that pretty well sums up how she looks at life. "Everyone has a special gift or something they are good at doing. It is up to us to help them find that talent or gift so it can used for the good of the person and everyone around them." I think that simple philosophy of life sums up my Mom. Thanks Mom for sharing your life with me, sharing in my joys and comforting me during my sorrows. Allowing me to live my life with timely guidance but not interference and always demonstrating to me how to live your life through god and giving of one's self to others which brings about great reward and satisfaction. The zoysia sod we laid last fall as a part of the bunker project for the most part was dormant when it was placed on the ground. It was green in most cases but did not have adequate enough time to set new roots before winter. That is what it is doing right now as the weather continues to warm. Its spending most of its energy setting these roots in place and attempting to grow leaf blades from the mowing that we are doing to it on a weekly basis. Neither are setting the world on fire with their growth. 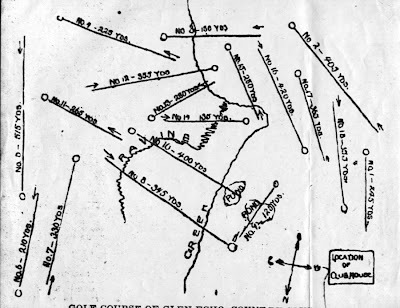 The areas most effected are the approaches of #1, new catch area approach along #2 green, trench lines across fairways such as #7, and the new sod on #18 approach. There are also some intermediate circles around the greens that were placed in zoysia as well. Most of the sod we received has germinated some winter annuals, poa annua and other weeds. Some of these weeds we have been able to mow out pretty well but some are requiring some light broadleaf weed control applications. We have not been too aggressive with these sprays because the plants are still young and tender and are having difficulty in this cool, wet climate we have been experiencing We will begin to add sand to the sod lines and topdress in the next week or so to improve the lies you are experiencing. Remember, Rule 25-1 does give you relief from sod seams. As the weather warms, the grass will grow up through the sand in the seams which will help to smooth out these areas. Optimum soil temperatures for warm season grass to grow is usually about 75-85 degrees. Right now we are in the upper 50's. There is nothing that can be done to improve these conditions without increased soil temperatures which increases the growth production within the plant. These temperatures also effect the established turf but not to the extent that it does new sod trying to establish. Also, the lack of sunshine slows the plants processes down to a minimum. Check out Dr. Lee Miller's report from University of Missouri regarding warm season grasses, soil temperatures and other pertinent information that effects the conditions of the turf that you are playing upon and that I am trying to manage at this time of year. The weather has not allowed us great access to the course this year but one area of the course that can now be played on a regular basis is our bunkers. They are draining nicely and the sand is fairly consistent. 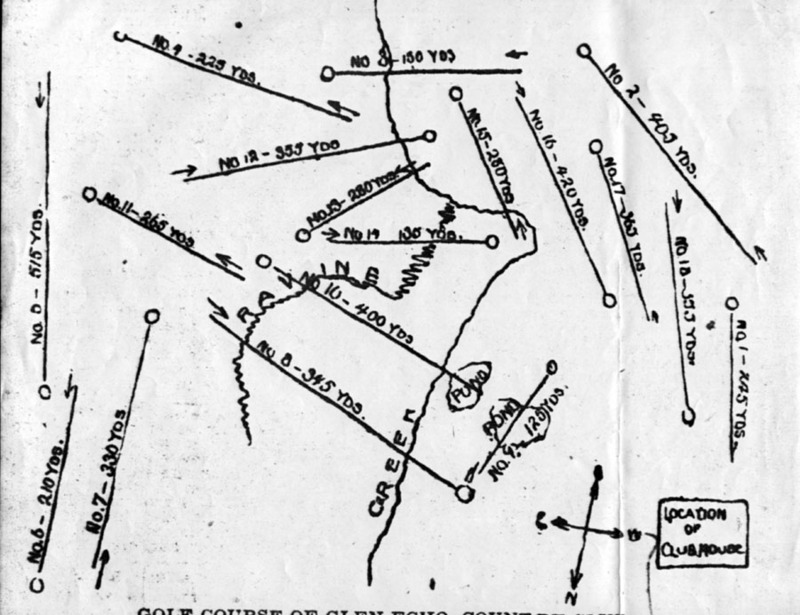 There are a number of items that I need to address regarding the bunkers and ultimately their play-ability. There is no doubt that they play much different than what we had in the past. New sand in general is always different than older sand. It does not have any silt or dirt in it and does not compact as well. It does drain well and for the most part is the same consistency. All the bunkers have drainage but some are in the sun more or in the open where wind can dry the surface out. Sand that has a small bit of contamination in it does not drain as well but it does play firmer than new fresh sand. Can't change the physiological makeup of the materials. It takes time for this material to settle and for us to get familiar with how to play out of it. I polled the green committee last night. Some are not having an issue and some are. I went out this morning and hit 3 balls out of the 18 left bunker. One hoped one off the stick for a gimme, 2nd within 8' and the third flew off the green. Tried a couple of other bunkers and could only flip one out of the bunker of 3 and flipped three out of the bottom one but only one made it to the green. Very inconsistent at best by me which is what you might be going through. No doubt, our golf professional Barrett Martens can help you with some techniques or equipment/club changes to help your bunker play. He has already been working with individuals and groups in improving their bunker play. Below I've listed a few things we have been doing and will do in the future to improve the play-ability of the bunkers as best as we can. We will continue to use our vibratory plate to help compact the bunkers. This is a short term improvement and will continued every 4-6 weeks during the season. We will begin to evaluate sand depths to make sure we have what is considered proper depth of 5-6". During the building there could have been some increases in depth. As the rains subside, we will be apply some wetting product to the surfaces which will assist them in holding more moisture which will firm up the surface. Also, as conditions begin to dry down, we will be using our surround irrigation which will keep the bunkers surface/subsurface a little more moist which helps with compaction. We will be working with our new mechanic to make adjustments in our raking machine to reduce disruption of the surface which increases drying which contributes to fried egg lies. Brooming sand, reducing the tines on the rake will dry the sand at the surface. In time, some natural organic material will make its way into the bunkers and break down. Grass clickings, tree debris, some small amounts of soil from time to time which. We attempt to keep the bunkers clean but this is a natural process which occurs over the years the new sand is in place. Excuse my amateur attempt at video. Used my cell phone this morning to talk about my effort at a bunker shot. 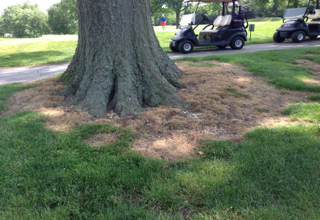 Every spring we are faced with a disease on our zoysia/Bermuda fairways, tees and surrounds. 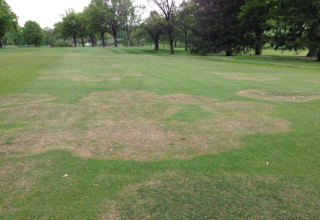 This disease is a fungus called large patch on zoysia. This disease normally begins its infection in the fall and will lay dormant over the winter. Once proper temp and moisture levels are reached, the infection begins to come active. I spot sprayed some patches about two weeks ago. More wet conditions and perfect temps have created additional outbreaks. As moisture begins to moderate and temps rise to mid 80's or higher and soil temps increase, the disease becomes less active and the turf begins to out grow the disease activity. You can recognize the actively diseased sections because they have an orange ring around the margins. In 99.9. % of the cases. 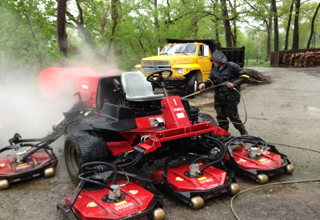 The turf usually comes back without any issue within a few weeks that heat arrives and we fertilize. We keep fertilizer off the fairways until the patch subsides because fertilizer can encourage expansion of the disease if still active. Becky is beginning to plant the ornamental beds with our plants grown in the greenhouse. One of the things that you might notice is that the plants are a little smaller than we would like them to be for installation. The extreme fluctuations in temperatures, especially at night and the lack of consistent sunlight has hindered the growth of our plants. Our over wintered and spring planting have been outstanding with a more English Garden style weather. Once we get into June and soil temperatures begin to increase, the plant sizes will begin to expand rapidly. The area on #9 dam which is a part of the woodland garden has been over run this year with a large crop of winter annuals including henbit and chickweed. We have sprayed most of this area with roundup, broad leaf weed killer and preemergent. We will then mulch it with our oak chipped mulch as soon as the weather dries enough for us to haul the material to the sight without creating significant ruts. To prevent this outbreak next season, we will have to pre-emerge this area in the early fall to prevent the annuals from emerging. Weather stats for April. I don't remember all the extra rain in April 2012. Always interesting to see what takes place at courses hosting tour events. The Players Championship is a step above your normal weekly tournament. 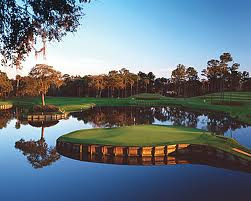 TPC Sawgrass Maintenance Department blog provides a lot of information about the event. Also, Adam Garr, superintendent at Plum Hollow CC in Michigan is making daily posts to Plum Hollow CC Blog which gives insight from a volunteer guest superintendent. Keep an eye on the twitter feed. I've been posting some interesting information fro Sawgrass for the last few days and will continue this week. 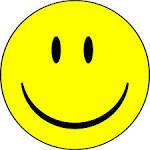 The staff and I are so happy!!! The staff and I are so happy that after 2.4" rain yesterday, we were able to put the course's bunkers back into play in less than 3 1/2 hours. We do have a few less bunkers than last year but we have bunkers that drain and have very little washing of the faces. It took just a little over 1/2 hour more than normal to do our work this morning. Not happy over the wet conditions but extremely happy with the work that we accomplished in a short period of time. Have we said thanks enough yet? We do not believe so! Thank you again!!!! Finally got some broadleaf weed control on the green surrounds of #5 and #6 in which the back half is mostly bermuda grass. I am also going to do some minor treatment around the intermediate cut for the poa annua which has popped up. We missed the winter application on these two green surrounds. My first intention was to allow it to over run the bermuda and convert it to cool season but it looks hideous. We have to be careful with spraying these plants out this time of year because the product we will use can move so we have to do this during a dry period and then water it down after it has had time to move into the plant to reduce the chances of a heavy rain rushing the material across the green. We intend to drill seed these areas in the fall with fescue in an effort to get rid of the bermuda for the most part. I did get the intermediate spray around #8. The poa annua is mixed with other cool season grass on #8 so we will not make any attempt to remove it until fall when we drill in more fescue and then spray a selective material that will help remove the poa from the other cool season grasses. You can see the knotweed, henbit and chickweed yellowing from the Momentum application. Hopefully, I can spray the poa annua in the next week or two to remove it. Late blooming this season is what I call our little corner of Augusta National, next to the 7th tee. 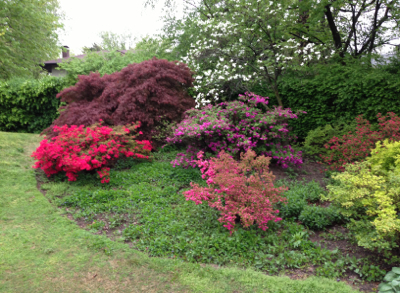 The Azaleas are in bloom as is the Flowering Dogwood and the Japanese Maple's color is a vibrant deep red. I believe this is the only spot on the property with azaleas, one of my favorite plants. Could be that the first house that our family owned when I was about 3 was one my grandfather built on Azalea Lane in Cape. He built the one across the street which gave me the opportunity to see him daily and have coffee breaks. Loved those times. Notice the larger light purple azalea. 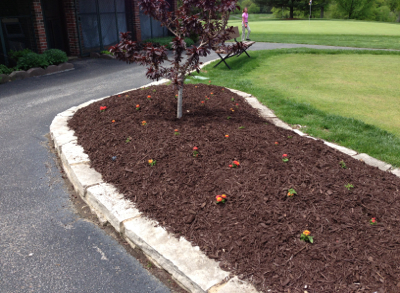 This plant was dug up from the old mound in front of the clubhouse last winter in the area of the Pierson Plaza. Quite remarkable that the plant survived the transplant and last season's extreme weather. I know Mr Pierson would marvel at its blooming during his walks each spring. A little heavenly intervention I'm sure took place to help this plant. While the seasonal staff were called off for the day, the full time staff still have work to do cleaning equipment, sharpening blades and etc. Still in the process of hiring a mechanic so we are catching up on preventative maintenance issues. Nick steam cleaning his rough unit.